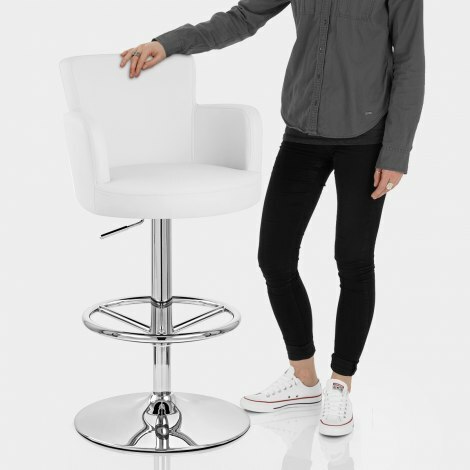 The Chateau Bar Stool White is a commanding item of furniture, with an eye-catching seat that really gives this stool a feel of opulence. Exclusively designed with the promise of style and relaxation, the Chateau is set to be the finishing touch to your décor. The chunky backrest rises from the seat, with armrests that curve off to either side, flanking the rear half of the seat. Comfort comes courtesy of high-density foam padding, which is found on the entirety of the seat and is covered in white faux leather for a minimalist look. Chrome plating is abundant on the frame below, where you will find the circular footrest and the base, designed to keep the Chateau stable as well as protecting your floor thanks to the rubber guard beneath. A gas lift mechanism finishes off the package, allowing you to raise or lower the Chateau as well as turn through 360 degrees. "Comfort, sturdiness and style in one stool"
Very pleased with first order of two white Chateau Bar Stools, 'found room' for a further two, which also arrived within the time slot, all packed and received in perfect condition. Your staff, when speaking on the phone were all very helpful and pleaasant ... Thank you Atlantic, a brilliant service all round!! A sturdy frame and posh expression. I bought three in September, all indifferent colours of white, black, and cream. I will definitely recommend the product. Very quick next day delivery, easy assembly, very sturdy and look great in our new kitchen, can't believe how comfortable they are, well worth the money.